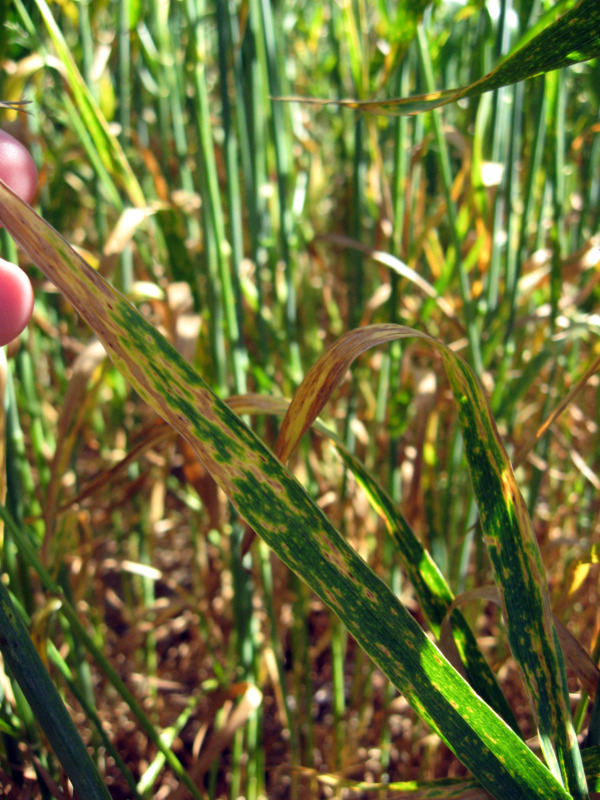 Leaf spot diseases affecting wheat in Western Australia are septoria nodorum blotch, yellow spot and septoria tritici blotch. They are caused by three different fungal pathogens but the disease symptoms and biologies are similar. Impact from leaf spot diseases vary greatly from season to season and between locations. They are particularly a problem in continuous wheat crops in stubble retention farming systems. For the most effective control, an integrated disease management approach is required and this is discussed here. This page replaces Farmnote 59/2005. Leaf spot diseases affecting wheat in WA are yellow spot (Pyrenophora tritici-repentis), septoria nodorum blotch (Parastagonospora nodorum; previously Phaeosphaeria nodorum, synonyms Stagonospora nodorum, Septoria nodorum), and septoria tritici blotch (Mycosphaerella graminicola). They are caused by three different fungal pathogens but the disease symptoms and biologies are similar. Leaf spot diseases in wheat appear as irregular or oval-shaped spots that initially are small and often yellow (sometimes blackish-brown), but enlarge to form brown dead centres, with yellow edges. Typically, a badly affected leaf will die back from the tip as lesions merge, reducing the photosynthetic area and causing premature leaf death. Differentiation of septoria nodorum blotch, septoria tritici blotch, and yellow spot on the basis of symptoms is difficult even to a trained eye. 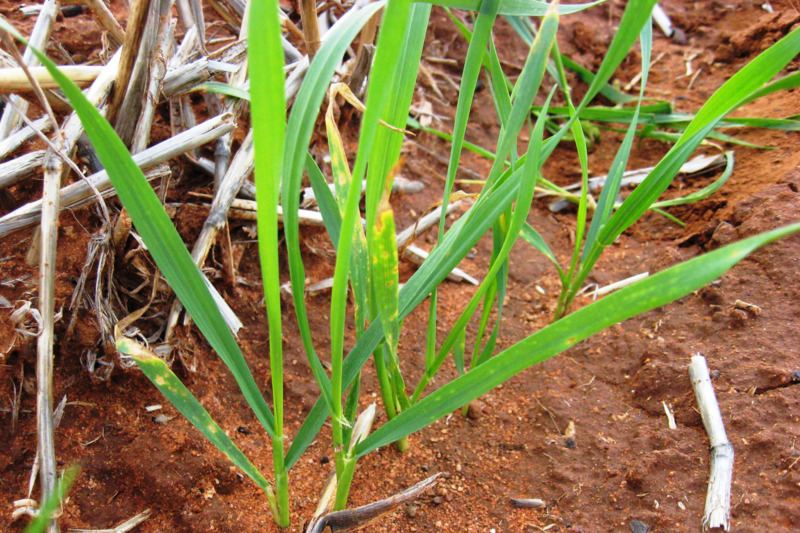 Some physiological or nutritional yellowing symptoms can be confused with yellow spot and septoria so it is important to get a correct diagnosis. More details on symptoms of each are available on the MyCrop pages at yellow spot, septoria nodorum blotch and septoria tritici blotch. See 'Disease diagnosis' section for diagnosis assistance that is available through DDLS - Plant pathology services. Septoria nodorum blotch and yellow spot may occur throughout the wheatbelt and frequently occur together. They have the capacity to significantly reduce yield and grain quality. Septoria tritici blotch has become less common throughout the WA wheatbelt and currently losses from this disease are rare. As such the remainder of this information here refers to yellow spot and septoria nodorum blotch. Impacts from yellow spot and septoria nodorum blotch vary greatly from season to season and between locations. They are particularly a problem in continuous wheat crops in stubble retention farming systems. Yield loss will depend on the disease resistance of the variety and the presence and severity of the disease throughout the life of the crop. For susceptible varieties, when the disease development is continuous due to favourable conditions throughout the season, losses around 30% have been measured. When disease development is only favourable for part of the season, either before or after flag leaf emergence, losses around 20% can occur. Severe disease will cause grain quality reductions such as increased screenings and lower hectolitre weights that can add to high yield loss impacts.